A pediatric dentist is a dentist who has received additional post-graduate training and specializes in treating children. While Dr. Swearingen isn't a pediatric dentist, he loves treating children and has had the training necessary to provide all the basic treatments needed for children. Many families prefer to take their children to a general dentist because they can have the whole family's care done at the same practice. With this, the dentist becomes like a part of your family. If Dr. Swearingen does see anything in your child that requires a specialist's attention, he will refer them to a licensed pediatric dentist. Make regular tooth brushing non-negotiable, but fun. This can be accomplished using stickers or songs that you sing to them while they brush their teeth during the early years. Begin brushing their teeth when their first tooth makes its appearance. It is ideal to get your child brushing their teeth on their own as early as possible so they develop good oral hygiene habits. For the first couple of years, you may have to brush for them. You want to minimize any swallowing of toothpaste. You can do this by using a small amount of toothpaste (no bigger than the size of a pea) to start. Also, teach them how to spit out their toothpaste as the foam builds in their mouth. You can make the drain of the sink like a bullseye target that they have to hit. Once their baby molars appear (around age two), floss their teeth once a day until they are old enough to take over the job themselves. Bring them in for dental appointments by the time they are three. 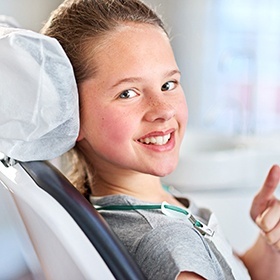 If children see a dentist before any problems actually develop, they will have a positive, fun experience. This helps keep them from developing dental anxiety, which is often the result of traumatic appointments. Once permanent teeth begin coming in, It is helpful to get sealants put on any teeth that have deep grooves or pits, which will greatly aid in preventing cavities in those teeth. We provide these in our office! We are always happy to answer any questions you may have. If you're looking for a children’s dentist, you can call our office to schedule an appointment or click here to request an appointment online.